Update for iOS 9 beta: Apple may have fixed this for iOS 9. If you work(ed) around this issue for iOS 8, make sure it also works correctly on iOS 9. In storyboard, I've created a popover presentation segue to present a navigation and view controller from a button, as well as creating an unwind segue. In portrait orientation, the modal (fullscreen) presentation is unwound/dismissed, as expected. In landscape orientation, the unwind segue also gets called, however the popover presentation is not automatically dismissed. Did I miss hooking something up? Do I have to dismiss the popover presentation myself? Update: After looking at gabbler's sample code, I've narrowed the problem down to popover dismissing fine in a Single View Application, but not in a Master-Detail Application. As I mentioned in the previous update, I created an new master/detail template, and simply presented a popover directly from (a button in) the detail view. It won't dismiss. I ran into this problem too. I present a View Controller modally (as a form sheet), from the Master View Controller (UISplitViewController). The problem only occurred on the iPad (probably the iPhone 6+ in landscape mode too, but I didn't check it). I ended up doing the following in my unwind action method (using Swift), and it works good. If you segue as a popover from a view controller embedded in a navigation controller, the corresponding unwind fails to dismiss the popover. It's a bug in -[UINavigationController segueForUnwindingToViewController:fromViewController:identifier]. The embedding navigation controller is supposed to supply a segue that will dismiss the popover but it doesn't. The fix then is to override this and supply a working segue, which we can get from the embedded view controller. It works on iOS 8 for both landscape/portrait iPad and landscape/portrait iPhone. The logic should be robust enough to survive on iOS 9. You said that in a single view happens what you want, but I've never seen that behavior when I used popOvers. This first checks if iOS 9 is running and just exit as the bug seems to be fixed. This will prevent the multiple views getting dismissed issue. Also to make sure this fix is only done when the splitView is showing two windows (to make it happen only on iPads and iPhone 6 Plus in landscape as well as future devices) I added the check to make sure it is not collapsed. I have not exhaustively check this but it seems to work. Also not that my app is set for a min of iOS 7, I don't know if this bug existed then so you may need to look into that if you support below iOS 8. 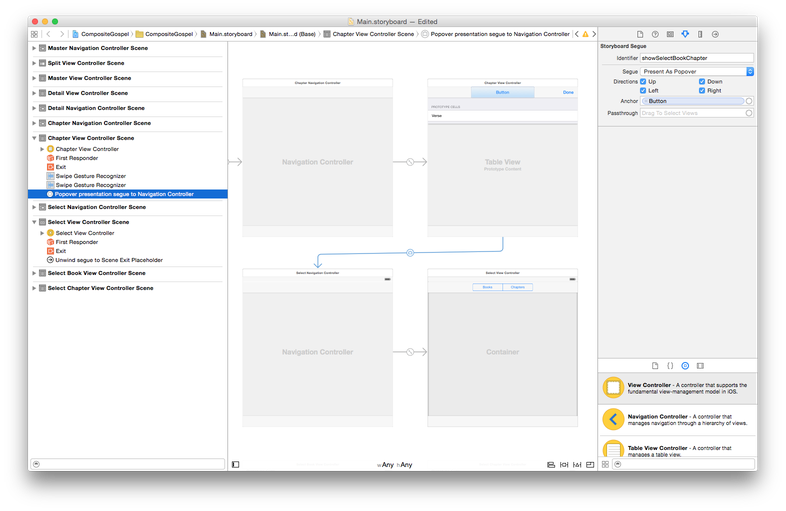 Adaptive segue in storyboard Xcode 6. Is push deprecated?